Sunderland AFC footballers Nicklas Bendtner and club captain Lee Cattermole, have been charged with criminal damage after cars were allegedly vandalised close to the home of their arch rivals. The two players will face magistrates later this month following an alleged incident in Newcastle city centre in December. Northumbria Police said the team-mates, who both live in Ponteland, Northumberland, will face five charges of criminal damage relating to cars parked in Stowell Street in Newcastle's China Town. The street is packed with restaurants and is a popular haunt with fans on their way to Newcastle United's stadium. The damage was alleged to have been caused at around 10pm on December 6, two days after Sunderland lost 2-1 at Wolves. Bendtner, a 24-year-old Danish international, is spending a year on loan from Arsenal. 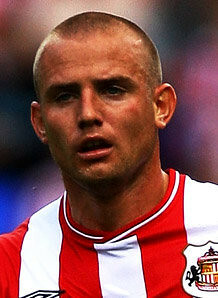 Both he and Cattermole, 23, have missed recent games due to injury. They will appear before Newcastle magistrates on February 27.